It was late Monday night, and I came back to my dorm stressed out and tired from a whole lotta things. 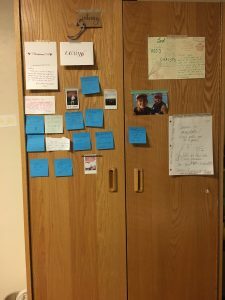 When I finally made it down the long hallway to my room, I noticed a blue post-it stuck on my door saying, “Carissa you got this” with a heart. When I walked into my room, I found SO MANY post-its with encouraging notes from my roomie Cori reminding me that I was loved. It made me tear up and totally turned my night around. Later on that week, I was majorly stressed about an English assignment, and I found two blue post-its on my bed telling me I was doing great and reminding me to breathe, that my friend Allie had written. How’d they do it? How did Cori and Allie impact me in such a powerful way while they themselves were on tight schedules? Sometimes, we know that our friends are going through hard times, but we don’t know how to encourage them. We get stressed because we already have a ton of responsibilities and aren’t sure how to help those around us when we can barely find time for our own to-do lists. So today, I wanted to talk about how we can bless those around us in a simple yet effective way. Know what makes your people tick. Cori and Allie both knew how much I love handwritten notes, so they made informed decisions to reach out to me in a way that made me feel loved. So let’s make a conscious effort to learn what makes the people around us feel loved. Knowing what makes your people feel appreciated and seen helps you to strategically bless them in a personal way. Be relevant. Sometimes, I feel like everything needs to be perfect before I can bless someone. I need to have a beautifully crafted card and a bouquet of flowers in order for someone to feel loved. But that’s simply not true. How many times have you ended up not blessing someone because you were waiting for things to be perfect? I know I’ve missed opportunities to be a positive influence because I’ve been too focused on making everything just right, and there’s never any time to make everything perfect. Instead of focusing on the details, focus on meeting someone in the moment of their need. People want to know others care, especially when they’re having a rough day/week/season. Goodness knows I needed some extra help that week, and my sweet friends rose to the occasion and ministered to me exactly when I needed it. They weren’t concerned about getting a fancy card, but used what they had–blue post-its–to write what I needed to hear. Focus on Christ. This might seem like a no-brainer, but I know that I often forget to put the focus on Jesus. It would have been easy for Cori or Allie to focus on themselves and what great friends they were. It would have been easy for them to focus on me and on how I needed to work harder and take better care of myself. However, they chose to focus on Christ, reminding me that my identity is wrapped up in Christ and repeatedly writing that I was loved. These beautiful reminders were exactly what I needed to hear. As our Heavenly Father reminds us in the beginning of Colossians 3, “Since, then, you have been raised with Christ, set your hearts on things above, where Christ is, seated at the right hand of God. Set your minds on things above, not on earthly things. For you died, and your life is now hidden with Christ in God. When Christ, who is your life,appears, then you also will appear with him in glory.” By putting the focus on Christ, my friends showed me what is truly important. It’s easy to allow friends to become emotionally dependent on us, and honestly it can feel good to feel like you’re someone’s savior. But we know that we only have one Savior, and he alone can save the hurting. By reminding me to run to Jesus, my friends helped me to draw strength from the Source of all. So when you’re thinking of how to help those around you but you feel busy and overwhelmed, remember that you can take a couple of short moments and influence someone for the better. First, know the people God has placed in your life well so that you know what means a lot to them. Next, remember to meet them in their need with relevance, not perfection. And above all else, direct their focus to their Heavenly King who adores them even more than you do. I kept all the post-its, making a little gallery of them on my wardrobe. Whenever I see blue post-its, I’ll always smile and thank God for revealing his love for me through my sweet friends who took the time to be his witnesses.